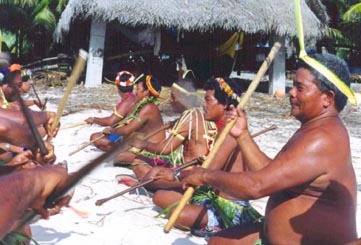 In this photo, the men perform a laiura stick dance in front of a canoe house on Satawal. Erailug can be seen participating, second man from the right. In many Carolinian myths, a recurring theme is the performance of laiura stick dances in Langimaal (Heaven).